IPerl meters read much like the odometer of a car. They read from left to right and record down to the tenth of a gallon. Carefully lift the lid to the meter can using a screwdriver. You may need to clean out the debris inside of the meter box to find the meter. Rwd 3 reads the meters electronically. Therefore, your meter may get buried by accumulated dirt. On the iPerl meter, there is a small round circle in the center of the meter next to the aberration "Gal". If there is water moving through the meter, a plus sign (+) will appear in the center of the round circle. 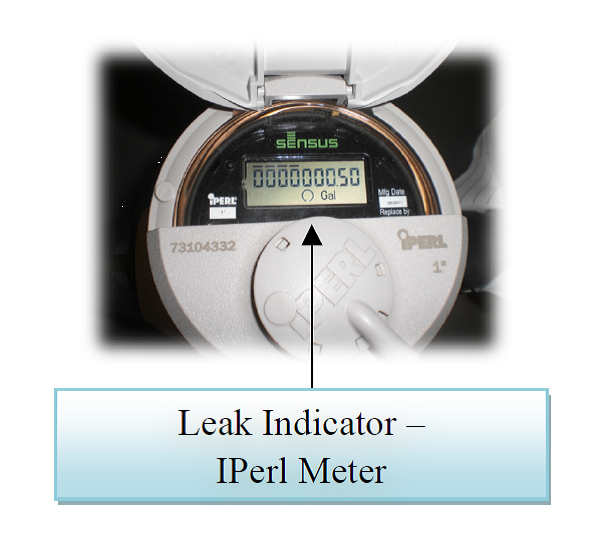 With the all of the water turned off on the inside and outside of your home, there should be no plus sign inside the round circle on the iPerl meter. If the leak indicator reflects water movement, you may have a leak. Outside Frost Proof Hydrants are generally the worst problem. The seal at the bottom of the hydrant becomes brittle or broken over time and needs to be replaced. If we can be of assistance, please call 405-707-7100.